The Bar Of Soap Is Done! Finally picked up my Bar Of Soap Mini Simmons type board yesterday from the boys at Shaper Studios. They just did the final sand / polish. FYI I didn’t glass the board – I just shaped the foam and painted it, then decided fin placement and let the boys do the rest of the dirty work. Glassing is an entirely separate art form in itself and I was happy to leave it in their hands. Put on a fresh coat of wax and drove up to Church since the SSW swell is passing us by here in Encinitas. The waves were crumbly at first but by the end of my three hour marathon sesh it had shaped up with the receding tide and the wind had eased up making it semi-glassy. All in all I had a blast on the board. I thought it would be difficult to ride and turn, but after a few waves I started getting a feel for it. The large fins definitely keep it stable, however, it’s not as hard to turn as you might think. I can bring it all the way around pretty quick as long as my foot is on the tail. On my last wave I did a snap cutback and nearly brought the board all the way around, maybe 3/4, and felt it start sliding. But it was loose enough that I was able to bring it back around and continue down the line. So fun, I’ve never been able to do that before. I even did a few weak off the lips and floaters. It’s not as easy to pump down the line as my quad fish, but I figured that you can pump it a little and getting it to the high line is pretty important. I’m going to need a few more sessions to really get a feel for it. But I am STOKED. Oh, and duckdiving is interesting. Even though it’s pretty squat at 4’11”, it’s beefy so it’s rather buoyant. The wide nose doesn’t help either. I got ragdolled a few times by a few sneaker 6ft sets at Church. 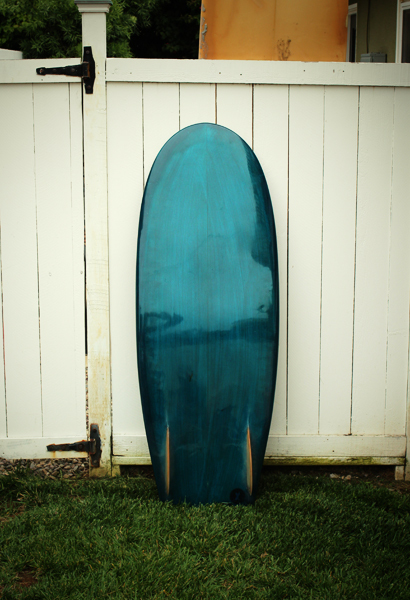 Anyway…if you’ve ever thought about making a board….you SHOULD. Actually I had never even thought much about making my own…until I watched Margaux and Jen doing it at Shaper Studios. I went there so much I eventually decided I had to do one myself. Once I saw Jen’s “cutie” that was it. It was exactly what I wanted to make.